Ginkgo leaf (Ginkgo biloba) is by far one of the most popular and widely used botanicals in the world for improving cognition and memory. 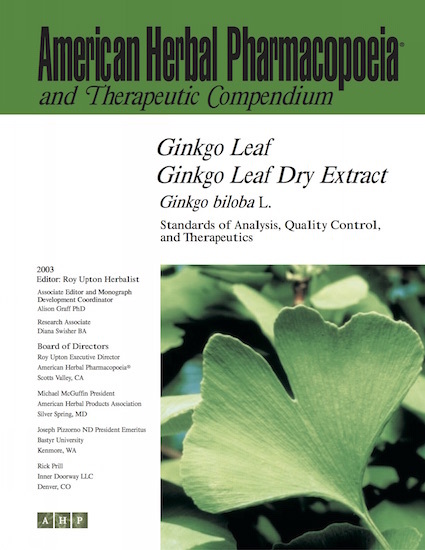 Between 1975 and the early 2000s, more than 40 controlled trials were published concerning the use of ginkgo leaf extract to treat patients with cerebrovascular insufficiency. The overwhelming majority of the available studies report positive findings, such as improved cognition and even a slowdown in the progression of Alzheimer’s. Management and treatment of Alzheimer’s patients is one of the greatest drains on Medicare expenses, costing the US in excess of $100 billion annually. A slowdown in the progression of Alzheimer’s by use of a supplement, such as a properly made ginkgo extract, could save hundreds of millions in health care costs. Unfortunately, ginkgo extracts have been subject to widespread and highly sophisticated methods of adulteration that have persisted for more than 20 years. It is fair to say that ginkgo is one of the most commonly adulterated herbal preparations on the market, predominantly due to the difficulty for analysts to detect adulteration, even when using pharmacopoeial methodologies. The AHP monograph addresses these issues of adulteration and presents solutions for detection. Another major safety concern that has been raised for ginkgo is its potential to potentiate the effects of conventional anticoagulants, leading to increased bleeding events. This concern was based primarily on a few case histories suggesting such an effect and in vitro studies showing ginkgo extract to inhibit platelet activating factor (PAF). However, a number of formal clinical studies have specifically addressed this issue and the findings are presented in the monograph.